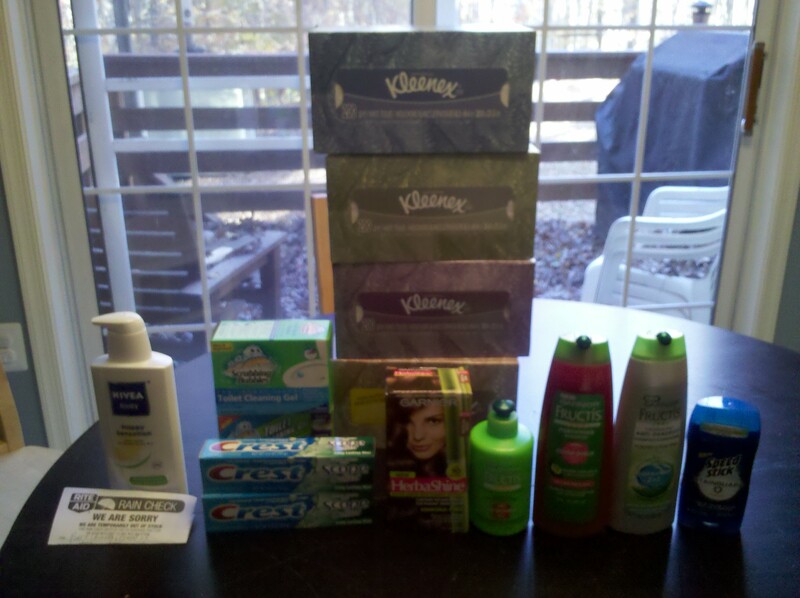 Rite Aid Shopping Trip 11/13/10 – All for $11.25 and got back $8.99! Wow! It’s been a long time since I posted a shopping trip and I thought this one was worth it to post. Check out all I got for $11.25 and I got back $8.99 to use on my next purchases. I’m really amazed at the deals that Rite Aid has with their new +UP reward program. I did this in a couple transactions because I had a raincheck for the Nivea lotion which would have been a $5 +UP but what the cashier did was put it towards my next purchase. What a great idea. I highly recommend getting to know the cashiers and managers at your stores because they can help you with rain-checks, checking the back for the product or even some other creative ways to help you get some good deals. I bought the Nivea lotion for $5.99 and got back $5 that they took off my next order. I spent $6.28. I then bought 4 Kleenex tissues 200 count for $2.49 B1G1 so I bought 4. I had a coupon for Buy 3 get 1 FREE max $2.25 and a $1.00 off Kleenex Rite Aid Video coupon. That made it $.43 a box. I also bought Speed stick cleanshield for $1.99 and used a $1.00 off Any Cleanshield Rite Aid Video coupon. That made it $.99. Then I bought Garnier Fructis Shampoo, Anti-dandruff, Leave In Conditioner and Hair Color. After spending $15 get $5 in +UP rewards. Last, I bought the hair color for $5.99 and used a $3.00 Manufacturer coupon. (I found out I could have used a Rite Aid Video coupon for $2 off.) That made it $2.99. I also bought a $.99 card. I used a $4/$20 coupon and a $1 off any non-prescription coupon from the Rite Aid Rewards Videos. I got $5 off from the Nivea lotion. I used a $1 +UP reward that I gotten a week or so go. I got back $5 from the Garnier Fructis Shampoo deal. I then purchased the 2 scrubbing Bubbles 2/$6 and the cashier suggested I get the toothpaste for $2.99 too. So I did. I used a $1.00 manufacture coupon for the scrubbing bubbles (couldn’t find another coupon at home), and the Crest toothpaste I used a $1.00 manufacture coupon. I also had a different $1.00 off a non-prescription coupon from Rite Aid Video Rewards. I also had two $2 +UP rewards to use up since they were going to expire. I spent $2.43 and got back $2.99 +UP reward for the Crest toothpaste and $1.00 +UP for the Scrubbing Bubbles. The cashier was fantastic and mentioned to me that I could get the toothpaste and again and even roll the $2.99 that I just got and get it again! I did just that I didn’t have a coupon but that was ok, because I didn’t need the overage. I got another toothpaste for $.15 and got back $2.99 +UP reward. That made my total to be $11.25 and I got back $8.99 to use on my next purchase.